All salts are NOT the same! Salt is a vital substance for maintaining your health. We constantly hear bad press about salt, and indeed refined salt is extremely unhealthy, however your body needs natural salts to function properly. Isolated, synthetic, sodium chloride however, with none of the valuable minerals and trace elements, cannot be assimilated by the body so well making it far less beneficial to the system. Another case of Mother Nature knowing best - pure, natural salt such as Celtic Ocean Sea Salt has the perfect balance of minerals, nutrients and sodium chloride that we need for optimum health; your body can recognise and absorb these essential nutrients efficiently. Celtic Ocean Sea Salt should not be confused with ordinary sea salts - many of these still go through a considerable refinement process. Ordinary 'natural' sea salt is generally missing around 90% of the essential trace elements and minerals. Sea Salt simply means it comes from the ocean. Most of these products have still been exposed to artificial heat, destroying the valuable structure and are mechanically harvested using metallic pipes and bulldozers. If it's a nice clean white colour, it has been refined. Insolubles 0.35, chlorides 52, sulphates 1.7, sodium 34, magnesium 0.95, potassium 0.15, calcium 0.15, zinc 0.0005, manganese 0.0006, iron 0.0150, iodine 0.00005. Plus trace and ultra trace amounts of all the minerals/trace elements in the earths crust totaling 90 in all. Ionic Liquid Minerals and Trace Elements also available from Regenerative Nutrition. This provides the perfect balance of sea minerals matching our extra-cellular fluid. Multiple population studies have shown that people who consume about 6 to 12 grams of salt daily live longer and have less disease than those who consume less than 6 grams daily. This may seem too much due to the anti-salt lobby brain washing us into thinking salt is harmful. There is a world of difference between medical opinion (driven by misinformation and prejudice) scientific studies and what happens to real people across the planet. Prior to refrigeration a fair proportion of the diet was preserved using salt. Civilizations flourished in areas where salt was freely available as sufficient salt is essential for robust health and full mental capacity. Since the introduction of refrigeration and the anti-salt lobby, many individuals have become salt impoverished. Prior to refrigeration a fair proportion of the diet was preserved using salt. Civilisations flourished in areas where salt was freely available as sufficient salt is essential for robust health and full mental capacity. Since the introduction of refrigeration and the anti-salt lobby, many individuals have become salt impoverished. This information about the need for 8+g salt daily for the best overall health, as determined by population studies, is based on average cases across thousands of people. No doubt there will be individual variations due, for example, to the the weight of the individual, the climate and physical activity, the diet (such as the inclusion of green leaf vegetables and raw juices) and individual biochemistry. We therefore encourage people to find the correct amount of salt to suit themselves. Unrefined salt such as Celtic Ocean Sea Salt and the superior Ionic liquid Mineral products (here and here) have a very similar mineral and trace element profile as the body's extracellular fluid. This may be better absorbed and more easily retained than refined salt. Diets rich in vegetable and fruit juices contain very little sodium chloride, and what little there is has to be converted to the chloride form, the efficacy of which is heavily influenced by individual bio-chemistry. The main point to be aware of from all of these population studies is not to be afraid of salt consumption, especially if unrefined salts represents a large proportion of ones usage. Add salt to your taste. If you do not add much salt to your food as a matter of course (especially vegetarians and even more so vegans) we suggest you check out your blood pressure and health in general and experiment to see if adding some salt to your daily routine makes a positive change. This can be done by adding Celtic Ocean Sea Salt, or preferably, Ionic liquid Minerals to drinks or even food that you would not normally consider (fruit, yogurt and smoothies for example). Symptoms of low salt status include, but are not limited to, excessively low blood pressure, higher than average tendency to anger and mental instability. Salt deficiency is possibly one of the main reasons that some vegans will struggle with their health. Salt has been treasured throughout time by both man and animals alike; it is a vital substance for maintaining health. We constantly hear bad press about salt, and indeed refined salt is extremely unhealthy, however we need natural salts for our bodies to function properly. "Salt" is sodium chloride; Sodium is an essential nutrient, the body cannot manufacture sodium, yet is it is required for life itself. Chloride is also vital for optimum health, it preserves the acid-base balance in the body, aids potassium absorption, supplies the essence of digestive stomach acid, and enhances the ability of the blood to carry carbon dioxide from respiring tissues to the lungs. Every cell in our body is bathed in a clear fluid called extracellular fluid, similar to sweat. The amniotic fluid that surrounds the foetus in the womb is of similar composition. The closest to this natural body fluid found in nature is sea water. We even find salt in our blood, sweat and bones, which makes it easy to see why pure, unrefined, salt is essential for good health. This takes on further meaning when we consider that the life forms we evolved from were single celled, sea organisms. It is worth noting that sea creatures die if exposed to a mixture of refined salt and water. Celtic Ocean Sea Salt is dried using a process first started well over 900 years ago. These salt makers, the Celtic people of France changed the archaic method of boiling sea water when they began to use the sun and wind as the method of preparing salt. This drying process in the natural elements of the West Brittany coast, charges the salt with natural energy. No metal ever comes into contact with the salt. The coast of Brittany, France is considered to have the best mineral content of any seawater in the world. Celtic Ocean Sea Salt does not go through any refining processes and retains it's natural grey colour and slightly moist crystals. The trace and ultra trace elements, 90 in total, are found in the earth's crust and it is these that give the vital greyish colour. The slight moisture reflects the ability of the crystals to retain the salts and minerals in a form that the body can assimilate. For a more thorough therapeutic response we recommend Ionic Liquid Minerals and Trace Elements. We see consistent results in nutritional therapy by using this diluted in a glass of water once or twice daily. This delivers the most balanced mixture of magnesium and the whole swathe of trace minerals present alongside the sodium chloride, and as such is even more wholesome than Celtic Ocean Sea Salt. Science has arrived at some dangerous conclusions based on the wrong salt. The vast majority of salt in the world is used for industrial purposes, only 7% is used for food, so it's no great suprise that the effects of refined salt are of little consequence to manufacturers. Refined salt is blasted with heat, changing it's very structure, after it is "chemically cleaned", what you are left with is Sodium Chloride without the life force of the essential minerals and trace elements. Additives, such as dextrose and bleaching agents, are then thrown into the mix creating a product that far from being naturally alive with minerals is in fact a dead chemical. Your body has to sacrifice energy in order to try and metabolise this refined salt, and it upsets many processes within the body including fluid balance and elimination systems. and is a natural anti-histamine. Please note that heavy metals and organic ocean contaminants are likely to be present in extremely small amounts in any unrefined sea salt, but the large amount of nutritional minerals in Celtic Ocean Sea Salt would buffer against these minute quantities of heavy metals and organic contaminants. Heavy metals and contaminants are found in much higher quantities in fish, especially large fish, due to accumulation & storage factors. Dr. Jacques de Langre believes that refined salt is toxic to the body, but that Celtic Ocean Sea Salt is extremely healthy and has the opposite effect of refined salt. Following is an article by Sam Biser including the transcript of his interview with Dr de Lange. "Don't be conned by the crusade against salt "
"I have found impressive medical evidence which explains why a low-salt diet will NOT help you live longer. But it CAN give you strokes, damaged kidney and brain function, and loss of sexual ability (impotence and frigidity)! Once again, I must blow the cover on a medical and health food crusade that's being jammed down your throat. I'm referring to the forty-year old health lie that, avoiding salt will help you live longer. The health food establishment has swallowed this one whole like Jonah in the belly of the whale. They solemnly tell you that avoiding salt will help lead you into the land of everlasting health. For most of you, it definitely will NOT. What they don't tell you is that..."
A low-salt diet for the treatment of high blood pressure is a colossal national disgrace, based on dogma, not evidence. A salt-restrictive diet can actually raise your blood pressure. A lack of salt can literally cripple your health, and cause liver failure, kidney problems, and massive adrenal exhaustion. On a salt-free diet, the valves of your heart muscle can tire, lacerate, and cause a fatal heart attack. The healing powers of good salt equal those of vitamin C, vitamin E, and many other nutrients in the health food store. The prevailing viewpoint of modem medicine is that salt is a general poison, like alcohol and tobacco. Salt has been vilified as the great devil at the dinner table. People have been taught since childhood that "salt causes high blood pressure." Books on salt-free cooking are more popular than ever. If you fall up the American Heart Association, they will send you brochures on the dangers of salt. The health media are always looking for simple, easy answers that don't require much thinking. Therefore, they routinely present the same, reckless, across-the-board advice to avoid salt whether you desperately need it or not. The tact that our population is a vastly heterogeneous group, with grossly divergent biochemistries, makes no difference to them. The chant is always the same: "Salt is bad!" It's gone far enough. This dogma must END. 'The idea that salt in the diet has some positive value is totally ignored." - Dr.A.M. Heageny, M.D., Department of Medicine, Leicester, United Kingdom. To present the other side of this controversy, I choose to interview one of the leading proponents of salt in the world. This man is a California biochemist name Dr. Jacques de Langre. Dr. de Langre has been studying the health benefits of salt for over 30 years. He has a Ph.D. in biochemistry from the University of Brussels. He wrote two books on this topic, "Sea Sail's Hidden Powers" and "Sea Salt, the Vital Spark for Life." Why the heart muscle works harder on a low-salt diet. Why a salt-free, vegetarian diet is a set-up for kidney, respiratory and blood sugar problems. Why "natural sea salt" is a number 1 health food rip-off. How macrobiotic salt can cause oedema. Why refined salt in any amount is NOT the answer for high blood pressure. Why a richly-mineralised salt makes it easier for the heart to contract and pump. Why eating the proper salt can help cleanse the plaque off blood vessel walls. "The most convincing fact that salt is critical to life is that amniotic fluid is salty." I guarantee, after you read this interview, your views on salt will never be the same. BISER: What is the reaction of most people when you tell them salt can be good for them? DE LANGRE: they say, "I can't eat salt. My doctor won't let me." All they have heard in the media is how bad salt is. When I tell people about the health benefits of good salt, they say, "I didn't know there was anything good to say about salt." Twenty-five years ago, I contacted some people in the book business. I said, "I have an idea for a book on Salt. "The chief editor said. "You sprinkle salt on your food. What else is there to know." I said, "A lot"
BISER: Why is the scientific literature so against salt? DE LANGRE: Science has arrived at some dangerous conclusions based on the wrong salt. 99% of the world's research on salt is dome on commercial table salt. This is the only salt they know of. They think all salt is the same but they're wrong. The medical doctors have a dilemma. Refined salt can cause a lot of problems. They are correct on that point, and that has been well documented. Yet, a salt free diet has problems of its own. They're in a scientific rut. Neither approach, taking refined salt, or avoiding it- is the answer. People desperately need salt for good health, and medicine doesn't have any solution. On the topic of salt, American scientists are very narrow-minded and insular. We are still in the dark ages of salt making. In many parts of France, when a person comes in with heart problems, high blood pressure, or other problems which are hard to diagnose, the first question the physician will ask is, "What kind of salt are you using." There is no such opportunity here, because the only recognised salt is refined, white table salt. Some of the best scientific research on the health properties of good salt are written in French, German and Portuguese. But few American doctors have read them. Two classic French medical books on salt are, "The Ocean that heals," and, "Secrets of our Origins." A German medical classic on the healing powers of salt is, "The Salt of Life." Because of his vibrant enthusiasm for salt, they call him "The Salt Man". Doctors from Australia, Italy, New Zealand, Japan England and Africa call him at all hours, and seek his wisdom on salt. We don't have medical books like this in North America. This country was raised on refined salt. We inherited this from the English. So, we have never been exposed to a healthy salt. All we know of is Morton's salt. Americans are totally ignorant of any natural process that can make a healthy salt. We choose to ignore that which is so essential to our biology, and so we continue to accept and spread the gospel on the dangers of salt. We have never been told there is another side. BISER: You wrote in your book that a healthy and active lifestyle demands an adequate intake of salt, is that true? DELANGRE: If your tears weren't salty, if your blood wasn't salty, if your sweat wasn't sally, you wouldn't be functioning very well. The current medical belief that our body can function on no salt at all, or on a restricted salt intake, causes more problems that it tries to solve. You can't function without salt. You can't digest food without salt. Your heart can't function. Your adrenal glands can't function. Your liver can't function. Your kidneys can't function. Sodium is the predominant cation in the circulating blood plasma-and tissue fluids. Derek Denton brought out this point in the medical physiology book, "The Hunger for Salt." Rene Quinton, the French physiologist, used the term "milieu intericur" the internal environment, the unchanging salty environment of our own "internal ocean." He talked about serum of all warm blooded animals on this earth. People forget, but everyone was born in a salty solution - our mother's amniotic fluid. This is probably the best biological proof we have that cellular structure in enhanced by salt. The amniotic fluid is a salty, 'mini-ocean* for the foetus. This is a prime example of why we need all of the ocean's minerals as part of our make-up. This is the very first thing anyone should discuss when talking about salt. This is basic. Your very blood needs salt to function. There was an article in the Scientific American on this topic in the July, 1963 issue, "The Social Influence of Salt." It said, "The chemical requirements of the human body demand that the salt concentration in the blood be kept consistent. "They discussed how you can die on a completely salt less diet. "The potential harmful consequences of salt restriction have not been examined. "Dr. M.G. Nicholis. M.D. Endocrine Department, Princess Margaret Hospital, New Zealand. BISER: Based on these thoughts, will a low-salt diet cause accelerated aging? DE LANGRE: Absolutely. Your cells must be bathed in a sodium-based, extra cellular fluid. When the cells are not in this fluid, they will explode, this has been proven biologically, the cells of a mammal deprived of sodium literally explode. Without salt, there is no longer any exchange between the sodium on the outside of the cell, and the potassium on the inside. Talk about aging, this is probably the one, single, most important biological fact that must be considered when you discuss salt. Deprived of that saline solution, the cells age. One the other hand, taking refined salt is not the answer. This will promote a pathological calcification and a breakdown of cellular tissue. In either case, you have problems. BISER: Will restricting the salt intake help high blood pressure? DE LANGRE: In the majority of cases, no. In most cases, the high blood pressure is not measurably lowered by restricting salt intake. Even a drastically reduced sodium diet - down 10 less that 1/2 gram/day, often fails to show any improvements in cardiovascular problems. Dr. John Laragh expressed the same though in the May, 1983 issue of the Annals of Internal Medicine (page 740.) ". It is likely that even drastic sodium restriction would not prevent hypertension, because fewer than half of hypertensive patients would respond." He goes on to say, "Public health policy should be dictated by facts, and not by hopes or opinions." I agree. In another article, in the January, 1991 issue of Hypertension, this same doctor states that salt restriction, as safe and effective treatment for the prevention of hypertension, "must remain an interesting speculation, without enough evidence to justify its conclusion as part of a national program." BISER: In scientific journals, I have read that a low-salt diet can actually cause high blood pressure in some people. DE LANGRE: That's true for some people. I believe that when the heart has much less of a fuel for contraction, it is trying to raise the pressure by restricting the arteries. If you have a regular mechanical pump that doesn't work well, or has a slow leak, you have to reduce the diameter of the vessel through which the liquid is being pumped. You can see how this would happen with a garden hose if you reduce the pressure. In this case, we are talking about blood. So, to compensate for a weak pumping action by the heart, the body compensated by increasing the pressure in the arteries. Lots of other things are happening as well. On a low-salt diet, not only is the heart working harder, but so are many of the other organs as well. "Nature put 84 elements in salt, as a buffer, to protect you from pure sodium chloride." BISER: How does a salt-free diet affect the heart? DE LANGRE: A salt-free diet can damage the valves of the heart. The contractibility of the heart muscles is negatively affected by a deficiency of salt. The heart can no longer contract normally. Remember, the heart is fed by a saline solution from the blood and lymph. On a salt-free diet. The valves of the heart can tire. They will begin to lacerate, and break up in shreds. Bio-chemically, without salt, the cells starve. On a salt free diet, you will not recover quickly after an illness. You can also get para anaemia. Salt is an energizer. That Recharge drink the athletes use is a salt-based fluid. There is a definite need for sodium chloride to maintain and rebuild the cells. I have talked to a few friends who are suffers. They say they get all kinds of nicks, cuts and scratches. But by being in and around the salt water, they heal very quickly. Salt, the good natural salt is very healing. If salt was so bad, why do they feed intravenously saline solutions in hospital patients. DE LANGRE: Because the body runs on salt. Without salt, we run out of electrolytes. Without electrolytes, our human batteries die out. BISER: A lot of vegetarians eat salt-less diets. Is this beneficial? DE LANGRE: It is very bad. You have so much ingested potassium from the green leafy vegetables, which is not neutralized by the sodium. If potassium is in excess in relation to sodium, the body loses its ability to produce hydrochloric acid, and then you have digestion problems, which vegetarians have. BISER: How does the salt-free diet effect the health of many vegetarians? DE LANGRE: They are open to a lot of respiratory ailments. This is because of the extra moisture on the lungs, which cannot be removed by the kidneys. They often have a lot of urinary infections. But I have gotten a lot of letters from vegetarians who have discovered my salt. They say they feel much better and have more energy. BISER: People generally think of salt as sodium chloride. But you don't accept that definition, do you? DE LANGRE: In this country, that is what people have been taught, all the way from kindergarten to medical school, to them, salt is pure sodium chloride. There is no other salt available in the U.S., so this rules their thinking. When people talk about salt. They overlook completely that there are 84 buffering elements in salt to protect people from the harshness of sodium chloride in its pure state. Nature put these complimentary elements in salt for two reasons: First, to make sure that people could use the sodium properly. And second, to ensure that once the sodium has been utilized, it will be eliminated completely and quickly from the kidneys. An analysis of salt goes way beyond the minerals and the chemical elements, there was an article on this topic in the September 1982 issue of Ocean Magazine They made a fantastic defence of salt, saying salt is not just chemicals, it is a lot more. There is bio-electric energy in salt; there is magnetism; there are vital and inert gases, such as helium, neon and argon; plus there are micro-organisms that are critical for the life of salt. They wrote, "Sea water is a complex chemical soup, containing 84 of the 103 known elements." Nature had a purpose in making our blood like the ocean. In the ocean, sodium is buffered. In our blood, the sodium is buffered. And in our diet, the sodium should be buffered as well. If you tried to inject pure sodium chloride intravenously, you would kill the patient. He goes into salt shock. This is well known in medical circles. In the 1900's, a medical doctor named Jacques Loeb, from the university of California, performed an epic experiment. He put fish in a tank of water mixed with refined salt, the same concentration of salt that exists in sea water. All the fish died. If fish can't live on pure sodium chloride in dilute concentration, how can we? BISER: Let's talk about Celtic salt, when did the method for Celtic salt first originate? DE LANGRE: the Celtic process of drying the salt by the sun and the wind first started well over 900 years ago. The Celtic people of France changed the archaic boiling method of preparing salt these salt makers were given royalty status. These methods were used along the entire coast, from the Netherlands to Morocco. Brittany, France was favoured because of the unusually bright sunny climate and prevailing winds. Today, this same pristine process of salt making continues. BISER: In very simple terms, describe how Celtic salt is made. Does it contain all 84 elements that are in sea water? DE LANGRE: Celtic salt contains every element that is in seawater, minus the mud. There are actually more than 84 elements in the ocean, but they haven't all been detected yet, to make the Celtic salt, ocean water is taken through a mile long decanting lake. This precipitates the particles at the bottom. The water then becomes a beautiful blue, more blue than any tropical ocean. This water is then guided in spirals along a series of concentrating ponds for 1-2 miles. When the salt reaches a certain concentration, they take out the excess magnesium salts, which are called the bitterns. The remaining salt is dried by the wind and the sun. There is never any heat used. What remains is biologically active, pure, moist, Celtic salt. No chemicals. preservatives, or anything else has been added. "Celtic salt lowers the blood pressure, because it removes the excess sodium from the tissues." BISER: How do you know Celtic salt helps to lower high blood pressure? That's a rather controversial concept, isn't it? DE LANGRE: We have had reports of people going to the doctor and their doctor saying, "Well, you must be taking less salt, because your blood pressure is lower." But the truth is, they didn't cut down their salt intake at all. They were taking the Celtic salt. We get a lot of letters on this point. One reader writes, "My husband has refused to get off salt, so he has always had high blood pressure. But since he stopped using the store refined salt, and started using Celtic Salt, his blood pressure is now normal." We hear this all the time. Here's a letter from a man in Los Angeles. "Two weeks ago I donated blood at a Red Cross station. At that time my blood pressure was 160 over 90. (Normal is 120 over 80). Yesterday, after hardly a week of using the Celtic salt, the only new addition to my diet, I recorded a blood pressure reading of 105 over 82.1 am convinced that your salt had a hand in reducing my blood pressure." Here's one more. "My husband has a severe problem with high blood pressure. Any amount of salt in the past would increase the blood pressure. Now, he used the grey Celtic salt, and his pressure does NOT go up." One old man who lives near me makes organic wine, he told me the same thing. He said his blood pressure went way down on the Celtic salt before, it was always high. BISER: How many people have mentioned something like this to you? DE LANGRE: in the last thirty years, I would say a couple of thousand. It's unbelievable. They all say the same thing. "All of a sudden my blood pressure is normal. What have I done? This is the most common thing I hear about the Celtic salt. BISER: Why does Celtic salt lower blood pressure? What's the mechanism? DE LANGRE: In regular salt, the refined sodium chloride often stays in the body long after it has done it's job. Celtic salt helps to remove this excess sodium, as soon as it is no longer needed. This is because the Celtic salt has magnesium, about 3/4 of 1%, by solids. One of the roles of magnesium in the body is to remove the excess sodium. The three forms of magnesium in Celtic salt which dissolves the sodium are Magnesium chloride, magnesium sulphate, and magnesium bromide. It's one of the great nutritional paradoxes that you have to give salt, in order to lower the level of salt in the tissues. BISER: You said you have been taking Celtic salt for many years. How is your own blood pressure? DE LANGRE: When I was 55, I was tested in Boston by two medical doctors. They both said I had the blood pressure of a twenty-year old. They were very, very surprised. I am 67, so that was twelve years ago. I have been using Celtic salt all of my life. I have never restricted my salt intake. Around here, they call me, "The Salt Man." I don't over do it. But I like salt. Three years ago. I had my blood pressure tested by a surgeon. It was extremely low. It was still in the same range as it was when I was 55. He said there was absolutely no cholesterol deposits in the arteries. I use the salt on a lot of my food. But whenever I have a check up my doctor says my salt level is normal. BISER: Haw long does it take for a person to notice a reduction in blood pressure on your salt? DE LANGRE: It varies with each person. Sometimes people call me less than a month later and say, "I had my blood pressure taken, and it has gone down. Could it be the salt?" I would say on an average, it takes a month or longer to notice a drop in blood pressure. Of course, everyone is different. There are always exceptions. The Celtic salt literally "scrounges" around the body looking for excess salt deposits in the interstitial tissue and it just drains this sodium through the kidneys. The Celtic salt will also help to dissolve kidney stones. Medical doctors have told me that. One woman from Montana wrote that when she first received Celtic salt, she felt like she had been given a bag of gold. Others say they can "salt their problem away." BISER: Suppose a person has low blood pressure, will taking the Celtic salt make their pressure go even lower? DE LANGRE: Not at all. The Celtic salt has this uncanny ability to bring back to centre whatever function is unbalanced in he body. If you have low blood pressure, the Celtic salt will bring the pressure back up. If you have high blood pressure, it brings it down. Only natural means can do this. A pharmaceutical drug, which is designed to lower blood pressure, will only work one way - "down." And they can bring your pressure so dam low, you will have problems. BISER: Have you heard stories of people who raised their low blood pressure on the Celtic salt? DE LANGRE: Yes, definitely. Of course. Celtic salt is a blood pressure normaliser. Most people can't under stand this, but Celtic salt has a 'biochemical intelligence.' It's a thinking salt. It is totally different from the dead, lifeless, refined salt currently used. We are probably consuming 2-3 times more salt than we need, mainly because we use a demineralised fined salt, they would find they need much less salt in their food. "I'm sorry to say, but most natural 'sea salt' is almost identical to supermarket salt." BISER: What do you think of natural sea salt sold in the health food stores? DE LANGRE: This can be just as bad for your health as regular salt. Most sea salt often comes from the same refinery as commercial salt. You can tell sea salt is refined because you can pick it up and it does not have any sign of moisture at all. Refined salt is very dry salt. This tells you the magnesium has been taken out, because magnesium is a water-hugging molecule. BISER: How do you know that oedema goes down on the Celtic salt? DE LANGRE: We met a very beautiful Japanese American girl a few years ago. The girl was healthy looking except for swollen ankles. She knew who I was. She said, "You're the salt man. I need to talk to you. Look at my ankles." I said, "Where have you been living?" She said, "I live on a macrobiotic farm and we use only the macrobiotic salt." This salt is refined, just like regular salt, but it has the stamp of approval from the macrobiotic teachings. We started heron the Celtic salt and told her to totally avoid the macrobiotic salt. Two days later she came to my wife, and grabbed her. She said, "Look at my ankles. The swelling is gone, they are now normal. I cannot believe the change." Macrobiotic salt is dangerous for you health. It is refined, desiccated and de-ionized. BISER: For a person with heart problems, would you recommend the Celtic salt? DE LANGRE: Definitely, in moderate quantities. I think the Celtic salt has the ability to cleanse the heart. Remember the famous experiment with the French doctor, Alexis Carrel? He kept a chicken heart alive for 37 years by feeding it this same Celtic salt. If he had used regular refined salt, the heart would never have lived that long. BISER: How much Celtic salt should a person use? DE LANGRE: Use it in moderation. Salt to taste. When using Celtic salt, use 2/3 the amount of salt you would normally use. If a recipe calls for 100 grams of salt, I will use only 65 grams of the Celtic salt. And it will have the same saltiness of the recipe. "A French physiologist named Rene Quinton healed thousands of people with a serum derived from sea water." BISER: So by using the Celtic salt, you are actually using less salt? DE LANGRE: Of course. Because you are meeting the taste bud's requirement. If you want to make a comparison test between the refined salt and Celtic salt, here is what to do. First taste Celtic salt. Your taste buds will be gently awakened. If you put the regular salt on your tongue, your tongue will be out of commission for at least 30 minutes. You cannot taste anything else. With the refined salt, your taste buds are stunned and weakened. Your sense of taste is suppressed. This is why you see people in restaurants piling the salt on in order to get some taste out of the food. The salt irritates the taste buds and inhibits them. Here's another experiment you can try if you are not too queasy With a sharp and clean razor blade, make a little cut on the back of your left hand and put some refined salt on the cut. Then put a band-aid on. Do the same thing on the right hand, but now cover it with Celtic salt. In the morning, you will find an inflammation where you used the refined salt. But not with the Celtic salt. I believe regular refined salt inflames the cells of the body. BISER: How does the Celtic salt affect your appetite? DE LANGRE: You don't need to eat as much food, because you are getting more nutrition from the food you eat. You will find you are satisfied quicker. BISER: Will people live longer on the Celtic salt? DE LANGRE: I definitely think so. Celtic salt is a cleanser of bodily fluids. It will help keep your body healthy. Nothing worked. As a last ditch I decided to try the "water cure". The water cure says to drink a gallon a day of water. Add one teaspoons of CELTIC SEA SALT. So I ordered some sea salt. Now its two weeks later and my blood pressure is NORMAL!!!! I feel incredible!!! I cannot believe that after all the crap that I've been through in the last six years, the doctors, the meds that this is all it took!!! Anyone with Hypertension should use Celtic Sea Salt!!! 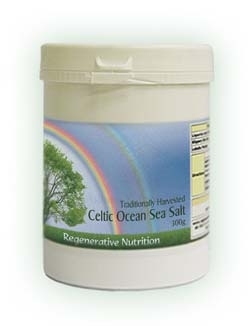 I've been using your Celtic Ocean Sea Salt now for some time and have recommended it to so many people. Many of which have suffered from high blood pressure and it has stabilised them. Wonderful stuff! !